Here is another beautiful card by Michele Storms using one of the French flower seed packs. I really adore the soft colors in this card. The white flowers and the soft aqua and ivory in the ladies wrap, and the soft greens in the background, and the sepia postcard and seed pack, and little pale moth, all just complement each other so well. So lovely and romantic. This could even be for a wedding. 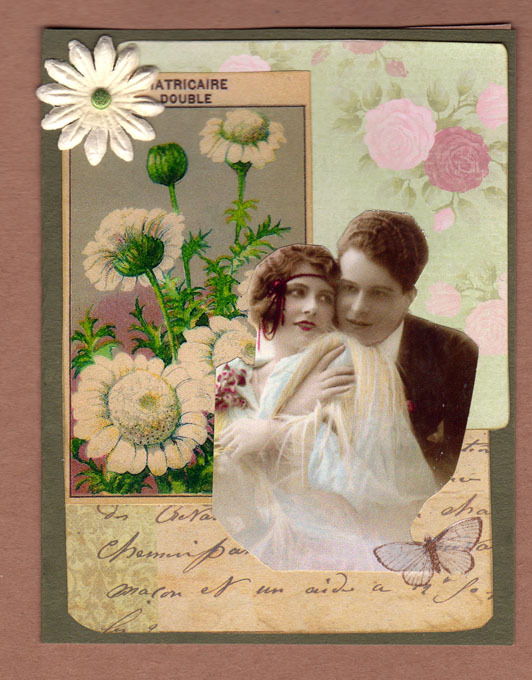 i matched up a sweet couple from the lunagirl vintage couples CD with some gorgeous flowers from the “french flowers seed pack #1” and layered them on various designer papers to make this romantic card. nothing like flowers to give one a lovey dovey feeling! Thank you, Michele! Beautiful inspiration as always. We have our first entry in the blog challenge, from Mandy. Link yours up, you still have a week! Wonderful card! Love the couple and the added butterfly!